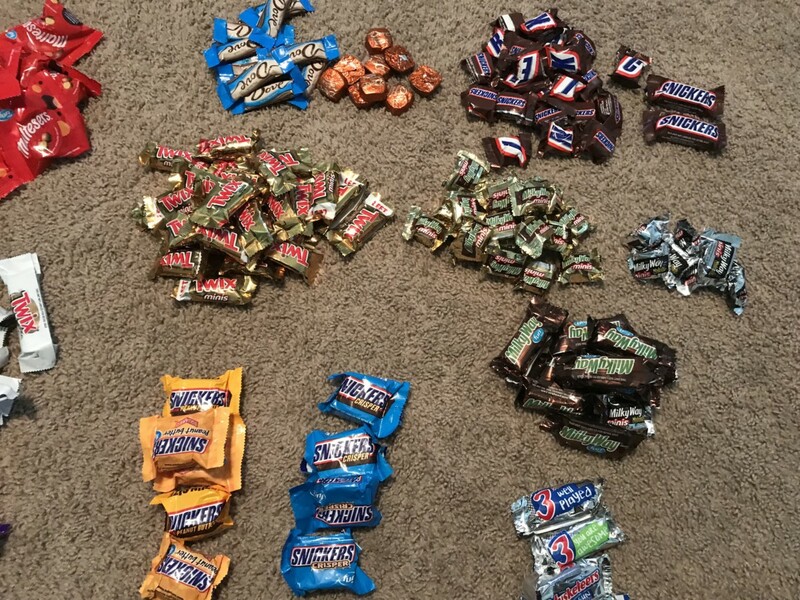 Have you ever wondered how much candy you get when going to Mickey’s Not So Scary Halloween Party? Well I’m here to show you! I have a family of 5 and we came home with so much candy, that we don’t even know what to do with it all! So this year was our first year that we went to the party stroller free. My youngest son is finally old enough to stay up late and walk the party from start to finish. In the past we would throw the kids candy bags into the bottom of the stroller when they would get too full, but this year that was not an option. So instead we brought a back pack to pour their full bags into. Well as you can see from the picture above, that back pack was stuffed full of candy! I would guess there was at minimum, 20lbs of candy in that bag! So what kind of candy do they give out? The good stuff! Not the cheap filler candy, but the stuff everyone likes! We got different varieties of Skittles, Starburst, Snickers, and M&Ms. There was also both dark chocolate and regular Milky Ways. Dark chocolate, white chocolate, and regular Twix. And there were also Three Musketeers, Dove chocolate, and Maltesers. So as you can see there is plenty of variety for everyone and you definitely won’t go home from Mickey’s Not So Scary Halloween Party empty handed! Happy Halloween!